Ashes has grown from an adorable puppy into a striking young lady. 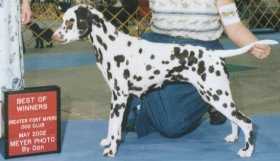 Singled out and just needing majors, Ashes was Best in Sweepstakes at the 2005 Mid Florida Dalmatian Club Specialty show and garnered a BOB/Group II from the classes. Ashes spends her non-show time as a full-time mascot for the Lehigh Acres Fire Department with "dad" Gene. Breeder: Trish Dreby & Mary-Lynn Jensen, Ph.D.